Our understanding of stratospheric ozone depletion has been obtained through a combination of laboratory studies, computer models, and atmospheric observations. The wide variety of chemical reactions that occur in the stratosphere have been discovered and studied in laboratory studies. Chemical reactions between two gases follow well-defined physical rules. Some of these reactions occur on the surfaces of polar stratospheric clouds (PSCs) formed in the winter stratosphere. Reactions have been studied that involve many different molecules containing chlorine, bromine, fluorine, and iodine and other atmospheric constituents such as carbon, oxygen, nitrogen, and hydrogen. These studies have shown that several reactions involving chlorine and bromine directly or indirectly destroy ozone in the stratosphere. Computer models have been used to examine the combined effect of the large group of known reactions that occur in the stratosphere. These models simulate the stratosphere by including representative chemical abundances, winds, air temperatures, and the daily and seasonal changes in sunlight. These analyses show that under certain conditions chlorine and bromine react in catalytic cycles in which one chlorine or bromine atom destroys many thousands of ozone molecules. Models are also used to simulate ozone amounts observed in previous years as a strong test of our understanding of atmospheric processes and to evaluate the importance of new reactions found in laboratory studies. The responses of ozone to possible future changes in the abundances of trace gases, temperatures, and other atmospheric parameters have been extensively explored with specialized computer models . Atmospheric observations have shown what gases are present in different regions of the stratosphere and how their abundances vary. Gas and particle abundances have been monitored over time periods spanning a daily cycle to decades. Observations show that halogen source gases and reactive halogen gases are present in the stratosphere at the amounts required to cause observed ozone depletion. Ozone and chlorine monoxide (ClO), for example, have been observed extensively with a variety of instruments. ClO is a highly reactive gas that is involved in catalytic ozone destruction cycles throughout the stratosphere . Instruments on the ground and on satellites, balloons, and aircraft now routinely detect ozone and ClO remotely using optical and microwave signals. High-altitude aircraft and balloon instruments are also used to detect both gases locally in the stratosphere . The observations of ozone and reactive gases made in past decades are used extensively in comparisons with computer models in order to increase confidence in our understanding of stratospheric ozone depletion. The stratospheric ozone layer shields life on Earth from the Sun’s harmful ultraviolet radiation. 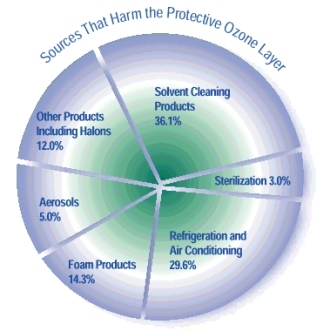 Chemicals that destroy ozone are formed by industrial and natural processes. With the exception of volcanic injection and aircraft exhaust, these chemicals are carried up into the stratosphere by strong upward-moving air currents in the tropics. Methane (CH4), chlorofluorocarbons (CFCs), nitrous oxide (N2O) and water are injected into the stratosphere through towering tropical cumulus clouds. These compounds are broken down by the ultraviolet radiation in the stratosphere. Byproducts of the breakdown of these chemicals form “radicals”—such as nitrogen dioxide (NO2) and chlorine monoxide (ClO)—that play an active role in ozone destruction. Aerosols and clouds can accelerate ozone loss through reactions on cloud surfaces. 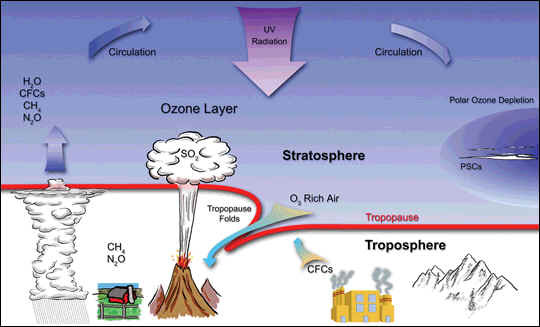 Thus, volcanic clouds and polar stratospheric clouds can indirectly contribute to ozone loss. 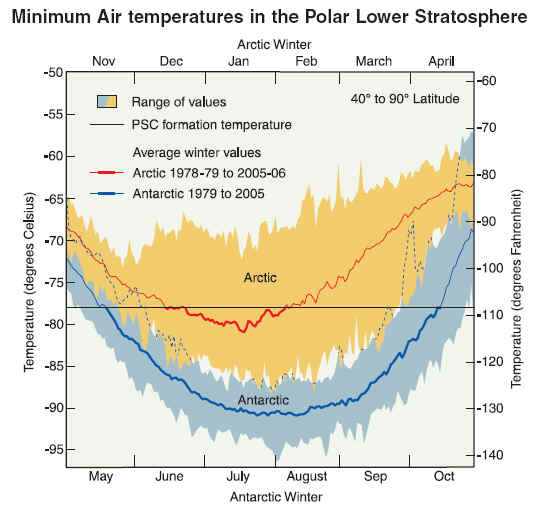 Stratospheric air temperatures in both polar regions reach minimum values in the lower stratosphere in the winter season. Average minimum values over Antarctica are as low as –90°C in July and August in a typical year. Over the Arctic, average minimum values are near –80°C in January and February. Polar stratospheric clouds (PSCs) are formed when winter minimum temperatures fall below the formation temperature (about –78°C). This occurs on average for 1 to 2 months over the Arctic and 5 to 6 months over Antarctica (see heavy red and blue lines). Reactions on PSCs cause the highly reactive chlorine gas ClO to be formed, which increases the destruction of ozone. The range of winter minimum temperatures found in the Arctic is much greater than in the Antarctic. In some years, PSC formation temperatures are not reached in the Arctic, and significant ozone depletion does not occur. In the Antarctic, PSCs are present for many months, and severe ozone depletion now occurs in each winter season. The animation illustrates how one chlorine atom in the stratosphere can destroy up to 100,000 ozone molecules. Ozone is destroyed by reactions with chlorine, bromine, nitrogen, hydrogen, and oxygen gases. Reactions with these gases typically occurs through catalytic processes. A catalytic reaction cycle is a set of chemical reactions which result in the destruction of many ozone molecules while the molecule that started the reaction is reformed to continue the process. Because of catalytic reactions, an individual chlorine atom can on average destroy nearly a thousand ozone molecules before it is converted into a form harmless to ozone. 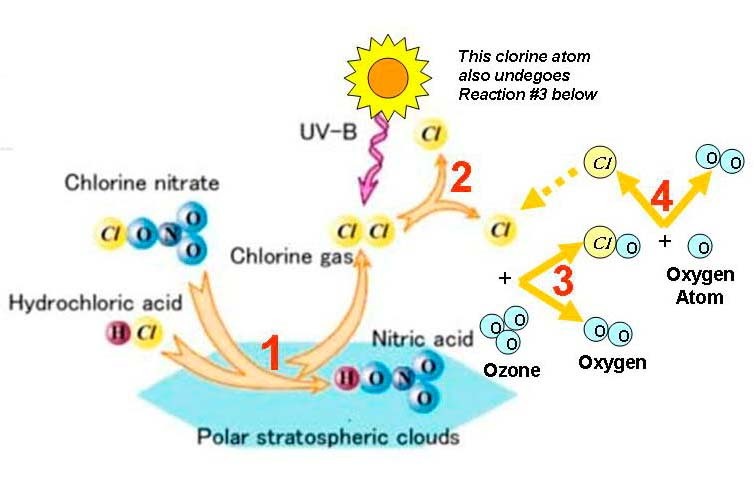 When ultraviolet light waves (UV) strike CFC* (CFCl3) molecules in the upper atmosphere, a carbon-chlorine bond breaks, producing a chlorine (Cl) atom. The chlorine atom then reacts with an ozone (O3) molecule breaking it apart and so destroying the ozone. This forms an ordinary oxygen molecule(O2) and a chlorine monoxide (ClO) molecule. 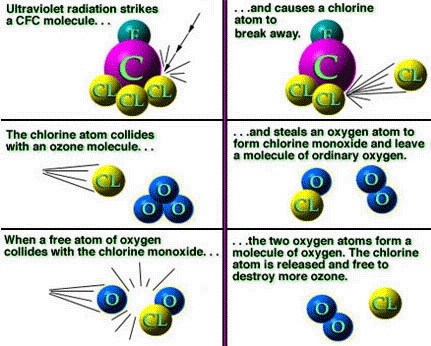 Then a free oxygen** atom breaks up the chlorine monoxide. The chlorine is free to repeat the process of destroying more ozone molecules. A single CFC molecule can destroy 100,000 ozone molecules. ** UV radiation breaks oxygen molecules (O2) into single oxygen atoms. and again... for thousands of times. The destruction of ozone in Cycle 1 involves two separate chemical reactions. The net or overall reaction is that of atomic oxygen with ozone, forming two oxygen molecules. The cycle can be considered to begin with either ClO or Cl. When starting with ClO, the first reaction is ClO with O to form Cl. Cl then reacts with (and thereby destroys) ozone and reforms ClO. The cycle then begins again with another reaction of ClO with O. Because Cl or ClO is reformed each time an ozone molecule is destroyed, chlorine is considered a catalyst for ozone destruction. Atomic oxygen (O) is formed when ultraviolet sunlight reacts with ozone and oxygen molecules. Cycle 1 is most important in the stratosphere at tropical and middle latitudes, where ultraviolet sunlight is most intense. Significant destruction of ozone occurs in polar regions because ClO abundances reach large values. In this case, the cycles initiated by the reaction of ClO with another ClO (Cycle 2) or the reaction of ClO with BrO (Cycle 3) efficiently destroy ozone. The net reaction in both cases is two ozone molecules forming three oxygen molecules. The reaction of ClO with BrO has two pathways to form the Cl and Br product gases. 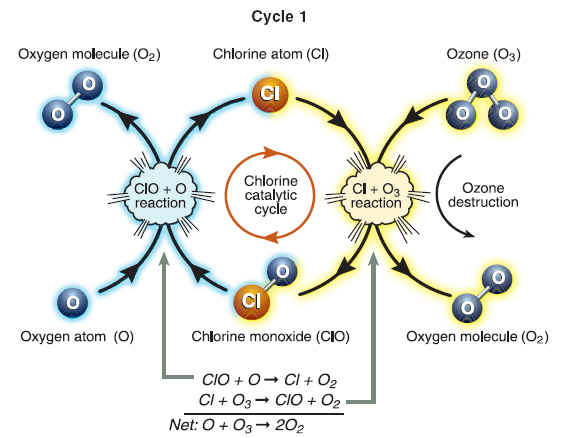 Ozone destruction Cycles 2 and 3 are catalytic, as illustrated for Cycle 1, because chlorine and bromine gases react and are reformed in each cycle. Sunlight is required to complete each cycle and to help form and maintain ClO abundances. The very thing that makes Ozone good for filtering UV radiation makes it easily destroyed: it is very unstable. As winter arrives, a vortex of winds develops around the pole and isolates the polar stratosphere. When temperatures drop below -78°C (-109°F), thin clouds form of ice, nitric acid, and sulphuric acid mixtures. Chemical reactions on the surfaces of ice crystals in the clouds release active forms of CFCs. Ozone depletion begins, and the ozone “hole” appears. Natural events such as Volcanic Eruptions can strongly influence the amount of Ozone in the atmosphere. However, man-made chemicals such as CFCs or chlorofluorocarbons are now known to have a very dramatic influence on Ozone levels too. CFCs a were once widely used in aerosol propellants, refrigerants, foams, and industrial processes. The process begins with the emission, at Earth’s surface, of source gases containing the halogens chlorine and bromine . 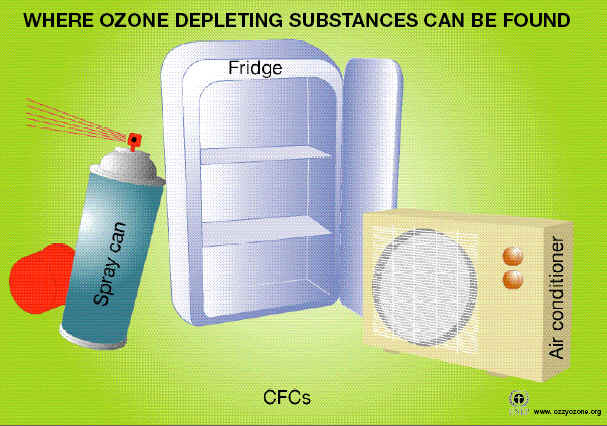 The halogen source gases, often referred to as ozone-depleting substances (ODSs), include manufactured chemicals released to the atmosphere in a variety of applications, such as refrigeration, air conditioning, and foam blowing. Chlorofluorocarbons (CFCs) are an important example of chlorine-containing gases. Emitted source gases accumulate in the lower atmosphere (troposphere) and are transported to the stratosphere by natural air motions. The accumulation occurs because most source gases are highly unreactive in the lower atmosphere. Small amounts of these gases dissolve in ocean waters. The low reactivity of these manufactured halogenated gases is one property that makes them well suited for specialized applications such as refrigeration. Some halogen gases are emitted in substantial quantities from natural sources . These emissions also accumulate in the troposphere, are transported to the stratosphere, and participate in ozone destruction reactions. These naturally emitted gases are part of the natural balance of ozone production and destruction that predates the large release of manufactured halogenated gases. Halogen source gases do not react directly with ozone. Once in the stratosphere, halogen source gases are chemically converted to reactive halogen gases by ultraviolet radiation from the Sun . The rate of conversion is related to the atmospheric lifetime of a gas ). Gases with longer lifetimes have slower conversion rates and survive longer in the atmosphere after emission. Lifetimes of the principal ODSs vary from 1 to 100 years . Emitted gas molecules with atmospheric lifetimes greater than a few years circulate between the troposphere and stratosphere multiple times, on average, before conversion occurs. The reactive gases formed from halogen source gases react chemically to destroy ozone in the stratosphere . The average depletion of total ozone attributed to reactive gases is smallest in the tropics and largest at high latitudes . In polar regions, surface reactions that occur at low temperatures on polar stratospheric clouds (PSCs) greatly increase the abundance of the most reactive chlorine gas, chlorine monoxide (ClO) . This results in substantial ozone destruction in polar regions in late winter and early spring . After a few years, air in the stratosphere returns to the troposphere, bringing along reactive halogen gases. These gases are then removed from the atmosphere by rain and other precipitation or deposited on Earth’s land or ocean surfaces. This removal brings to an end the destruction of ozone by chlorine and bromine atoms that were first released to the atmosphere as components of halogen source gas molecules. Tropospheric conversion. Halogen source gases with short lifetimes (less than 1 year) undergo significant chemical conversion in the troposphere, producing reactive halogen gases and other compounds. Source gas molecules that are not converted are transported to the stratosphere. Only small portions of reactive halogen gases produced in the troposphere are transported to the stratosphere because most are removed by precipitation. Important examples of halogen gases that undergo some tropospheric removal are the hydrochlorofluorocarbons (HCFCs), methyl bromide (CH3Br), and gases containing iodine . 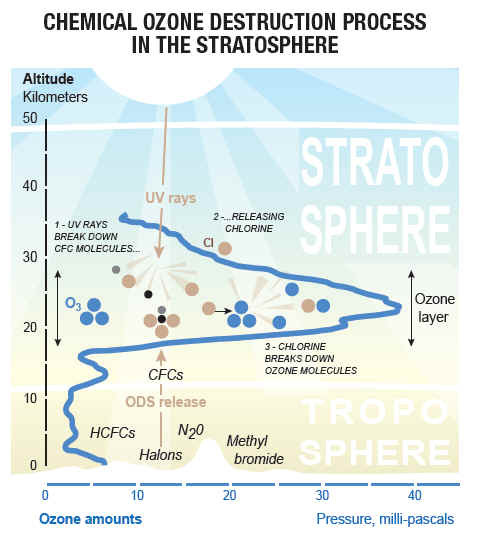 Diagram showing the effect of polar stratospheric clouds on ozone loss. The upper panel shows the situation when there are no polar stratospheric clouds. Ozone depletion takes place only in the gas phase (homogeneous chemistry). The lower panel shows the situation when there are polar stratospheric clouds present. The reservoir gases hydrochloric acid and chlorine nitrate react with each other on the surface of the PSC particles through a red-ox reaction and liberate elementary chlorine (Cl2 ). Elementary chlorine is easily photolysed by sunlight and forms atomic chlorine, which reacts fast with ozone to form chlorine monoxide (ClO, active chlorine) and oxygen (O2 ). ClO dimerises and forms Cl2O2, which is easily photolysed, liberating atomic chlorine again. Due to this catalytic cycle, one atom of Cl can destroy thousands of ozone molecules before it is passivated through reaction with NO2, methane or other substances. This explains why a few ppb of chlorine can destroy several ppm of ozone. In addition, PSC particles can grow large enough to sediment, thereby removing HNO3 from the stratosphere. This means that there will be limited amounts of NO2 present to quench the active chlorine, and the ozone depleting process can continue for several weeks. The diagram has been made by Finn Bjørklid, Norwegian Institute for Air Research (NILU).